The Haven by Del Webb in Bluffton, SC is located next to the acclaimed Palmetto Bluff. Spacious homesites and fewer crowds have made The Haven a popular retreat among active adults. The Haven provides a perfect blend of seclusion, yet conveniently close to shopping, restaurants and cultural attractions. The Haven has been carefully planned to co-exist with nature and you will enjoy the majestic live oaks and towering pine forests filled with wildlife. Exteriors of stucco, hardiplank and cultured stone complement the natural setting. The Retreat is an 8,500 square-foot clubhouse that is the central hub of social entertainment and houses the amenities residents would want or need. This beautiful clubhouse features a fitness center, game room, craft room, catering kitchen, ballroom, billiards, Internet cafe, and multi-purpose room. Outdoor amenities include a zero-entry pool, covered patio, gardening plots as well as two bocce ball, two pickleball and four tennis courts where residents can get together for social fun and fitness activities. There is also a firepit, dog park, and tot lot for residents to enjoy. Walking and biking trails meander throughout the community and even extend into the larger master planned New Riverside neighborhood of Bluffton, South Carolina. Del Webb began construction at The Haven in 2007 and has plans to build about 500 homes upon completion. There are a variety of single-family ranch floor plans available in The Haven ranging from 1,590 to 3,000 square feet. These well-crafted single-family homes offer one to four bedrooms, one-and-a-half to three-and-a-half bathrooms, and an attached two to three-car garage. Most floor plans offer an optional second-floor loft that may be customized to include an additional great room area, bedroom or bathroom. Single-family homes are available on a resale-only basis. Lagoon and wooded homesites are available on large quarter and a half-acre sites. Some buyers favor The Haven for its acres of protected land and more spacious homesites than Sun City Hilton Head. Active adults can be as social as they want within The Haven community due to its recreational clubs and activities. There are plenty of clubs and activities to keep 55+ residents entertained all year long, such as book club, tennis club, wine club, history group, coffee talk, and lunch bunch. Residents can also stay healthy and fit by participating in activities like aqua aerobics, pickleball, bocce ball, walking, aqua golf, and yoga. An activities director is also available to help plan and organize events, seminars, clubs, and parties for homeowners at The Haven to keep their social calendars full. The Haven is centrally located off SC-46 and SC-170 in the New Riverside section of Bluffton. World famous Hilton Head Island and historic Savannah, Georgia are only 15 miles away. The southern charm of Charleston, South Carolina is approximately 90 miles north. The Haven is surrounded by great shopping, dining and entertainment venues. Berkeley Place, which includes restaurants, shops and Cinemark Cinemas is just four miles away. Plus, the Tanger outlet malls, Walmart, Target, Home Depot, Lowes, Best Buy and many other retail stores and restaurants are within ten miles from The Haven. Cultural events and festivals are a common occurrence in Bluffton, Hilton Head, Beaufort and Savannah. Kayaking, boating and fishing are available in the local rivers, intracoastal waterway and Atlantic Ocean. Over 40 renowned golf courses are available in Bluffton and Hilton Head and The Haven has special discounts for residents at four golf courses within 3 miles of the community. 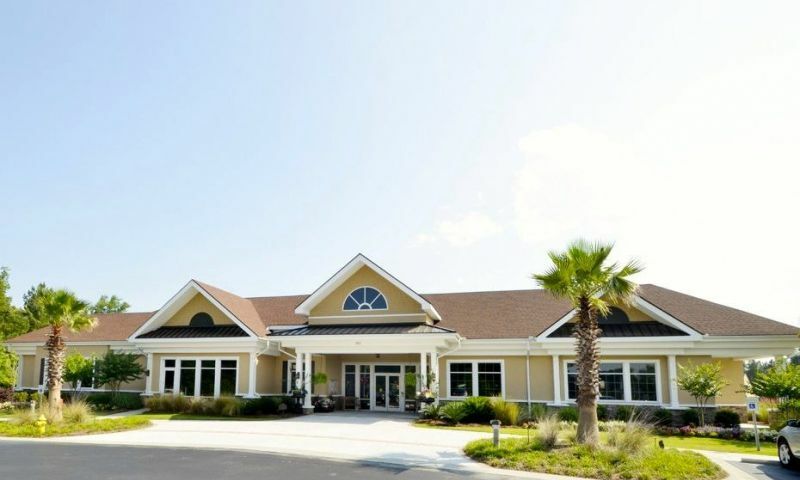 Active adults can enjoy living a social lifestyle at this beautiful retreat at The Haven in Bluffton, South Carolina. The Retreat - 8,500 Sq. Ft. There are plenty of activities available in The Haven. Here is a sample of some of the clubs, activities and classes offered here. The single-family homes within the Passport Collection range from 1,152 to 1,424 square feet and have one to three bedrooms, one-and-a-half to three bathrooms, and an attached two-car garage. These homes are available on a resale-only basis. These homes are available on a resale-only basis. They range from 1,590 to 2,637 square feet and have two to four bedrooms, two or three bathrooms, and two to three-car garages. These single-family homes are available as new construction and resale. They offer 1,656 to 1,961 square feet of living space. These homes offer two or three bedrooms, two or three bathrooms, and an attached two-car garage. These single-family homes are part of the Reserve Collection and are available on a resale-only basis. These homes offer 2,050 to 2,597 square feet of living space. They have two to three bedrooms, two to three-and-a-half bathrooms, and two to two-and-a-half-car garages. These single-family homes are available as new construction and resale. They offer 2,411 to 2,562 square feet of living space. These homes have two to three bedrooms, two to three-and-a-half bathrooms, and two to three-car garages. We bought a new home in early 2018. We looked at several other communities in Florida and in Bluffton. The draw for The Haven was the size, amenities, proximity to the beach and setting. The Haven has been a great place to live with lots of activities and new friends. The price of the new home versus similar plans in other developments offered good value. We are not golfers so the lack of community golf course was not an issue. Besides there are plenty of public courses in the area with resident rates. We moved into the Haven on July 14, 2015. Love it. We bought it sight unseen but because of your great pictures from the Internet we knew it was for us. The natural settings and surroundings is what really drew us to this fine community along with it being so pet friendly. The neighbors are great too. We purchased a resale (2009) home in 2012. We feel like we are on vacation all the time. Great neighbors ever one is so friendly. We have beautiful walking areas, gated and you feel very safe. We have dogs and one of the reasons we chose the Haven was we could fence the back yard. Most 55 plus communities don't allow fences. We purchased a new home here in 2010 and are very happy with the home and the community. We liked that it is planned to be a smaller neighborhood so it feels more private, plus it is gated. We have gotten to know our neighbors really well and have made lots of great friends here. There are plenty of activities to get involved in and clubs to join. Del Webb does a great job offering a wide variety of activities. The clubhouse is fantastic! 55places.com is not affiliated with the developer(s) or homeowners association of The Haven. The information you submit is distributed to a 55places.com Partner Agent, who is a licensed real estate agent. The information regarding The Haven has not been verified or approved by the developer or homeowners association. Please verify all information prior to purchasing. 55places.com is not responsible for any errors regarding the information displayed on this website.